Holy (*)(*)(*)(*). Never seen a winter like that. Never seen snow. For example, winter in Norilsk (not my photo). The thermometer -64 °C (-83 °F). Here some more little bricks of the Russian winter. Bricks. Ice bircks. These are ice blocks which janitors have brought down from the rooftop. And so — on all length of the house! A few days ago the snow fell again. Already no one expected, because the spring this year was warm. 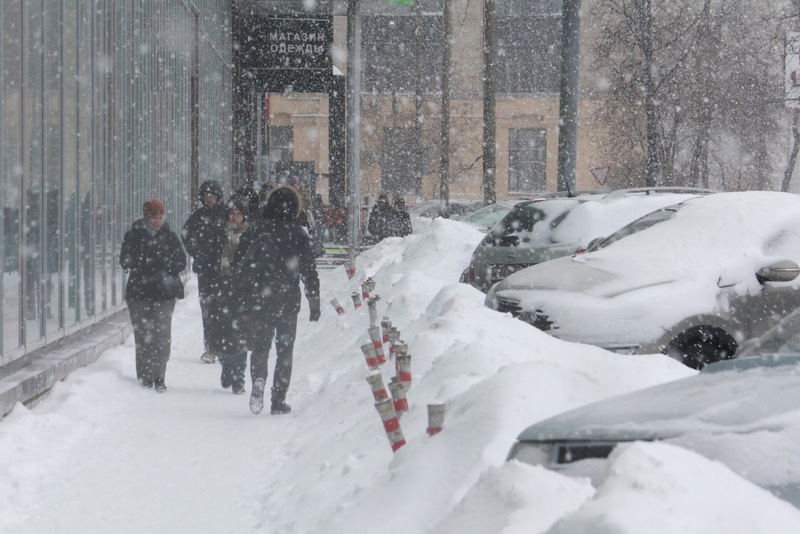 But - snow fell and even the temperature dropped below 0 °С. Today it became warmer and almost all melted, the snow now lies only in the shade under the trees. A week ago it was +26°C (+79°F). But winter returned again. Although the snow was falling heavily for a couple of days, but yesterday was a real surrealism. Cherry tree blossomed. The surrounding area is bathed in its scent. And all this - under the snow! This is how I came back yesterday from the office. There's nothing else. And now near the house ... As they say, more - more!